A good way to obey the strict laws against Environmental Pollution. 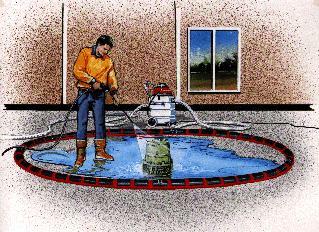 An innovative and practical waste water capture system to prevent run-off from washing operations indoors and outdoors. A highly effective spill containment system for many hazardous materials. The Vacu-Boom is a hollow, flexible tube five inches in diameter that is placed directly on a hard surface to form a downslope side dam or to completely encircle the wash or containment area. The boom has a C shaped cross section with the open side down. There are small liquid inlet openings on the water side of the boom at the bottom edge. During use, the boom is connected by a 25 ft. vacuum hose to the portable wet vacuum recovery unit. When the wet vac system is turned on, the Vacu-Boom tightly seals itself to the surface like a giant suction cup, to form an impervious liquid barrier. Simultaneously, the waste water or other liquid is extracted into the boom and travels with the airflow through the boom and vacuum hose into the sump of the vacuum unit. The vacuum unit is equipped with an automatic pump out system which discharges water through a discharge hose into a holding tank, filter unit or sanitary sewer. When containing highly toxic materials or flammable liquids that should not be drawn into the vacuum unit, the vacuum is used only to create a tight seal between the boom and the surface. The liquid is not extracted through the boom and vacuum. Where can Vacu-Boom be used? What are some of the features of Vacu-Boom ? Can be used on any hard surface such as concrete, asphalt, wood and steel. Fast set up and take down - less than 5 minutes for one person. Simultaneously captures and extracts liquids for waste water and many liquid spills. Captures and contains concentrated flammables or hazardous liquids without extraction. Materials used in Vacu-Boom do not absorb liquids and contaminants. Can be rinsed off easily after use. Easy to store and transport. Vacu-Boom breaks down into 5 ft. long sections. High degree of tolerance for acids, caustics and petro chemicals. Can Vacu-Boom be used in my environment? Many questions that you may have about using the Vacu-Boom equipment have already been answered for our customers. Reading the FAQs (Frequently Asked Questions) about Vacu-Boom will help you understand how you can use Vacu-Boom productively in your environment. What is included in a complete Vacu-Boom system? Vacu-Boom (see information on sizes and configurations to follow). 25 ft. long 2" vac hose with Cam-Lever quick coupler. Heavy duty portable wet vac. Automatic pump-out system (inside the wet vac). 25 ft. long 1 1/2" discharge hose with Cam-Lever quick coupler. Vacu-Booms can be assembled into a variety of configurations. The basic element of a boom is a 5 foot long section. The sections are joined together by devices called clips to form various lengths and shapes. Special fittings called end caps are used as end closures and vac hose connection points. Other fittings called center taps and square corners are available for certain configurations. VB20-VR1A 20 ft. Vacu-Boom system with 101 CFM vacuum recovery unit, automatic pump out system, hoses and fittings for use in a sloped surface application (not a closed loop). VB20-VR1B 20 ft. Vacu-Boom system with 202 CFM vacuum recovery unit. All other features are the same as VB20-VR1A system. For use on rough surface applications or to allow for use of longer boom lengths in the future. VB40-VR1B Same as VB20-VR1A but with 40 ft. long Vacu-Boom instead of 20 ft. long boom and 202 CFM vacuum recovery unit. Optional boom lengths available in increments of 5 ft.
VB-CL12-VR1B Closed loop Vacu-Boom system to form a 12 ft. diameter circle. Complete with 202 CFM vacuum recovery unit, automatic pump out system, hoses and fittings. VB-CL15-VR1B Same as VB-CL12-VR1B, but for a 15 ft. circle. VB-CL18-VR1B Same as VB-CL12-VR1B, but for a 18 ft. circle. Optional sizes available in any diameter (minimum 12 ft.). Vacu-Boom systems are available in virtually any length or shape using standard components. Examples are straight lines, arcs or semicircles, full circles, elipses, squares and rectangles. Contact Pressure Power Systems, Inc. sales department for application recommendations and pricing.